In order to better celebrate our upcoming 30th Anniversary (and prepare for the next 30 years!) I have taken on the task of going through piles of old VHS tapes, programs and posters to form a retrospective of sorts. It’s always been fairly easy for me to complete one concert and move on to the next, but much harder to give each an organized archival storage. Technology has, of course, changed everything.. but I’m still not as organized as I ought to be. When the company gave their first performance in the Spring of 1985, “I Don’t Believe We’ve Met”, posters were designed by hand and physically “cut & paste” and we didn’t video the first few concerts due to lack of easy access to the technology. 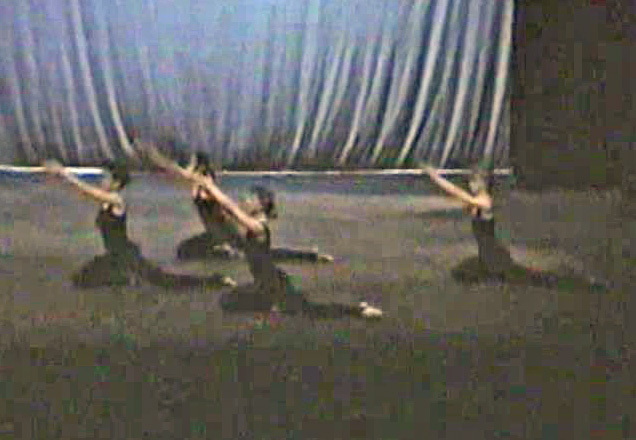 (Probably a good thing when I think back to some of my early choreography!) Some photographs and posters of those years still remain and you’ll be seeing them as this project progresses. Also, an apology to any dancer who is left out! I was pretty smug in the early years, assuming that I’d always remember everything and everyone, but the truth is that not everything stays in consciousness. Or, it’s in consciousness, but not “filed” by exact year! So, if any of you should read any of these postings and remember names… please fill in the blanks and/or make corrections…that would be wonderful. 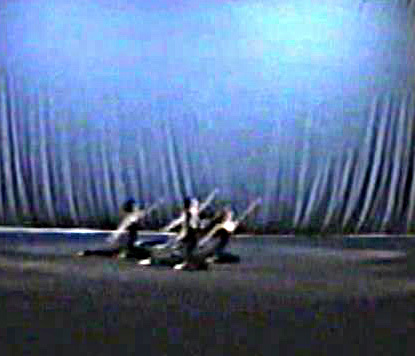 My first entry to this retrospective however, is slightly out of chronological order… In the spring of 1988, I choreographed a piece called “Anima Rising.” Some of the dancers involved with this piece were Teri Copeland, Carol Ernst, Sophia Thomas, Shelagh Nugent, Suzi Bulger, Leslie Addiego (?) … and I’m looking for a program because there were others as well. Looking back at the video, I recall being heavily influenced by the mythologies of the feminine, archetypal images of women, contemporary culture, and the Joni Mitchell song “Anima Rising” although that song was never used in the piece. I did love Mitchell’s line, “Anima rising, Queen of Queens, wash my guilt of Eden, wash and balance me.” Oh, and also her phrase, “She’s a vengeful little Goddess with an ancient crown to fight.” That phrase really suited the “perpetually cranky” side of me as well as the part that believed in woman as powerful beings that shouldn’t allow themselves to be victims. One of the photos I’m posting here is of a quartet; Teri, Sophia, Suzi, and Carol. This was one of the more “introspective” sections of this dance, which was set to a wide range of music including work by Andreas Vollenweider, Peter Gabriel, and Grand Master Flash and the Furious Five’s “Planet Rock”…. an eclectic mix to say the least. PreviousLooking for Dance for Parkinson’s Posts?